The qualities of the hardware used on the arch of Harpsicle® Line harps has an enormous impact on the ultimate voice and performance of the harp. Here is some of the basic background information on these critical components. Rees Sharping Levers shown here on a Rees Concert Line Harp. A sharping lever (not, “sharpening” lever) is a device that raises the pitch of the string one half step. For example, a string tuned to F when the sharping lever is neutral becomes an F# when the sharping lever is engaged or, more interestingly, for those who want to have the key of F in their harp, a string tuned to B-flat when the lever is neutral becomes B-natural when the lever is actuated. The sharping lever allows the harper to play in different keys without having to retune the instrument. Levers also provide for accidentals when necessary. Sharping levers achieve this by shortening the vibrating length of the string a specific amount with an added fret while slightly stretching the string. This is similar to the first fret on a guitar except that on a harp the sharping lever makes the fret movable by engaging and disengaging the string. A high quality sharping lever will have enough mass and rigidity so that it does not dissipate the string energy and, instead, forces the vibrations back down to the soundboard where they belong. Micro-threaded piano/zither pins are the silver colored pins with the string wrapped around them. These pins do not go all the way through the arch and can only be seen on the left side of the harp. Micro-threaded pins have an advantage over some other pin types in that the micro-threads reduce pin slip. 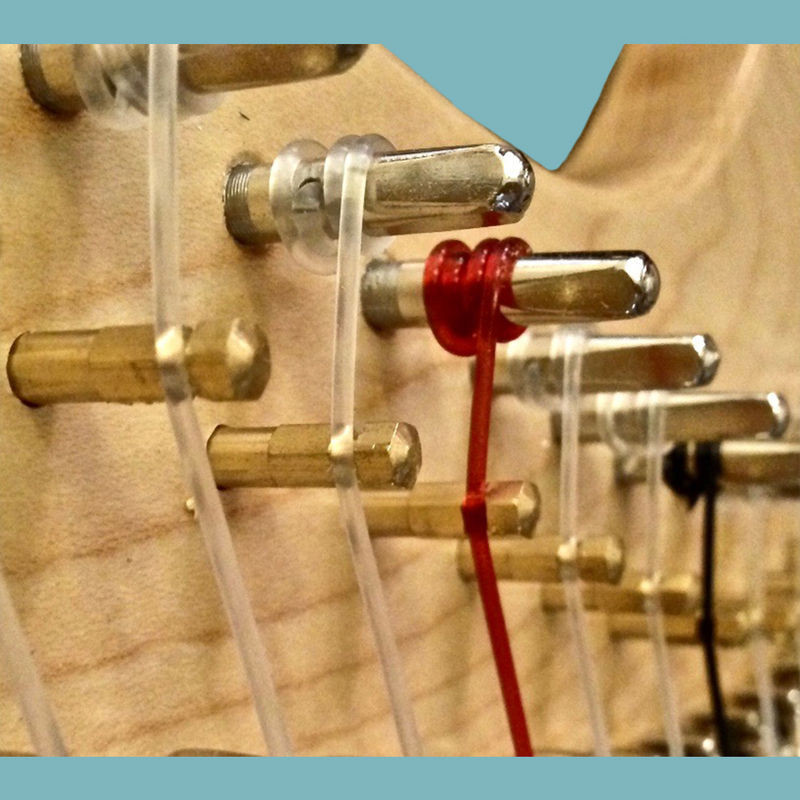 The further benefits of this type of pin is that it removes less wood from the vulnerable arch of the harp. This is especially important on smaller harps. Zither pins are both light and relatively inexpensive. These latter two characteristics are essential to those who are prioritizing either the final cost of the instrument or the overall weight. The one thing to remember about a zither pin is that when changing a string the pin needs to be backed out by four full turns so that it does not end up being turned too far into the arch of the harp. Bridge pins are found just below the tuning pins on any harp that has levers. The bridge pin is the one which touches the string but the string is not wrapped around it. The function of the bridge pin is to hold the string at the angle and height necessary to feed it properly into the sharping lever. As with tuning pins, bridge pins can be either threaded or plain the former becoming much more popular in recent years because they are easier to adjust and regulate.